Located on Baranof Island on the outer coast of southeast Alaska's famed Inside Passage, Sitka National Historical Park rests in the heart of North America's only temperate rainforest. The park is lush with Sitka spruce and western hemlock trees towering over a verdant undergrowth of berry bushes, mosses, and fern. The waters of adjacent Sitka Sound are alive with salmon, harbor seals, sea lions, porpoises, and whales. The Native Tlingit people occupied this portion of Alaska's panhandle for centuries before Danish-born Vitus Bering mapped the west coast of Alaska for Russia in 1741. In 1799, the Russians returned to trade tobacco, sugar, firearms and other European goods with the Tlingit in exchange for their hunting skills and labor. Unwilling to submit to Russian demands, including allegiance to the tsar, Tlingit warriors battled unsuccessfully to retain their homeland. Eventually, the Tlingit returned and settled into a restive peace with the Russians. The 1804 Battle of Sitka, known locally as “Daawootl Tlein,” marked a watershed event in the history of the North Pacific. President Benjamin A. Harrison initially reserved 50 acres near the mouth of Indian River as a public park in 1890 to preserve the scenic landscape in the vicinity of the battleground. In 1910, President William Howard Taft invoked the Antiquities Act of 1906 to further protect the area as a national monument for “the decisive battleground of the Russian conquest of Alaska in 1804, and ... the site of the former village of the Kit-Siti tribe, the most warlike of the Alaskan Indians ... and ... the graves of a Russian midshipman and six sailors, killed in the conflict, and numerous totem poles constructed by the Indians, which record the genealogical history of their several clans” (Proc. No. 959). 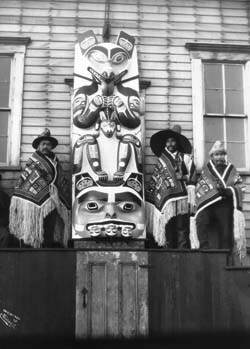 The proclamation included the Tlingit village, believed burial sites of Russian seamen lost in the battle, and totem poles brought from other southeast Alaskan sites. In February 1952, the monument's size increased to 54.33 acres with the addition of private property adjacent to the park. The Russian Bishop's house, the Old School, and the Priest's Quarters were added, and the park became Sitka National Historical Park in 1972. The Russian Bishop's House, once home to Ioann Veniaminov, regarded as the most famous Russian Orthodox clergyman to work in Alaska, is a National Historic Landmark and one of the only remaining examples of Russian log architecture in the Western Hemisphere. Archeological discoveries at the Bishop's House yielded ancient artifacts, such as stone tools and what might be a Tlingit lip ornament, but most of the materials recovered, such as glass, ceramics, copper nails, clothing, and shoe fragments date to the 1860s. These artifacts are displayed in the park's visitor center. One hundred years after its designation as a national monument, the park is now undertaking its first comprehensive archeological survey of the land near the battle site. Items located to date, including Russian cannon balls, grapeshot, and metal implements, are providing a richer, more complete historical account of the 1804 conflict. Today, Sitka Natural Historical Park encompasses 113 acres. Sitka's visitors are attracted by more than 2 miles of hiking and walking trails through the park. One trail is lined by a collection of 15 totem poles, each ornately carved with traditional formline figures that tell stories of a family or commemorate a person or a place. Visitors can picnic and play games on the banks of the Indian River, fish, or just observe the richly varied plant and animal life. The park's visitor center houses striking historical Tlinget items, including house posts, house screens, and original totem poles. Many of these are on loan to the National Park Service from local clans that periodically remove them for traditional ceremonies. Continued use of these precious objects underscores their ongoing cultural importance. The visitor center also contains the Southeast Alaska Indian Cultural Center where visitors can observe and interact with Native Alaskan artists who share their culture while creating traditional Northwest Coast art and handicrafts.